URGENT: The New New Space; even better than the Old New Space - Commit now! Lots of info about Rocky Lake Drive location in this email. If you previously committed to membership please email us to confirm you're still in. TL;DRAllan St is out; Rocky Lake Drive is in. This space is on par, or better, than everything we proposed for Allan St. It is also significantly bigger, at 900 sq. ft. compared to 625 sq. ft. The only downside is the location is further out from the core of the city. Given the significant change in location we want everyone who previously committed to fire us a quick email with a yes/no regarding if you are still committed as a member. We have a Social Night on Wednesday, July 19th 7pm at Uncommon Grounds on South Park St. Feel free to come with any questions about the space. We still need 20 members. Lack of members by Monday, July 31 will mean we cease looking for a physical space in order to concentrate solely on group projects, library classes, social nights and all the other cool stuff we do as a virtual makerspace. The New “New” SpaceWe have a signed lease offer extended from the landlord and are ready to go. The only thing we need on our end is to confirm we still have 20 members. I’m sure you want to know a bit about this space. The following two photos might be enough to convince you. The first is the proposed floor plan for how we can use the space, after we tear down one wall. The second is my terrible photoshop job at showing how amazing we could look with our own sign hanging over the door. The space is located about a 10 minute walk up the hill from Sunnyside Mall in Bedford. Bus routes 80 and 66 run by Sunnyside mall on 30 minute frequency from Halifax and Dartmouth, respectively. There is a large parking lot for the building we will be in. The space is already subdivided in a way that should be pretty conducive to our needs of having a room for woodworking, a room we can equip with ventilation for laser cutting and 3d printing, and a large room for general work and workshops. 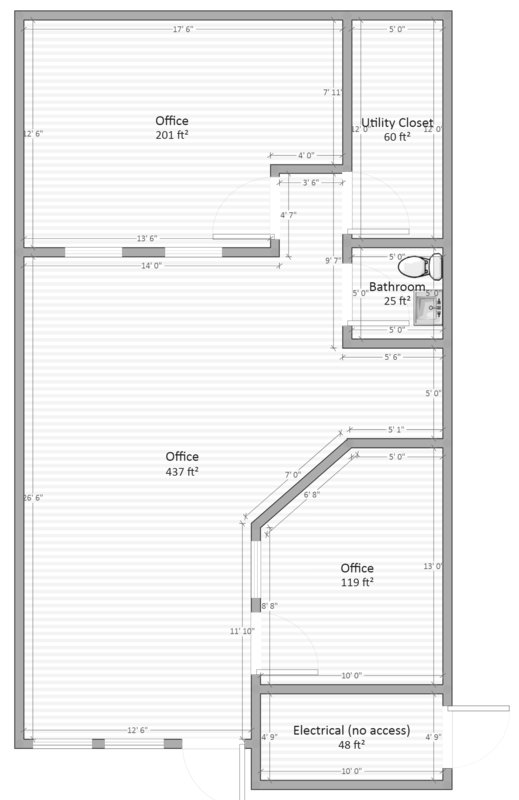 There is one wall we will likely tear down to combine two rooms; as pictured in the proposed floor plan. We also are free to modify the internal walls to suit our needs. Access to the unit is on the ground floor and is not shared with any other units, so we can build and install our own keycard system. (This might be one of the first, fun group projects when we get into the space.) The unit has its own washroom and has plumbing for us to build a small kitchenette. ...and we will happily build on this as demand dictates. The Goal and DeadlineTo cover our monthly expenses means we need 20 people to commit at the $50/month level. This gets you 24hr access to the space. As we mentioned before there is an initial signup fee equal to 1-month of membership. That bit of cash combined with existing money in the bank will give us a buffer of two months of operating expenses. We are also still open to a partial membership of $25/month that will allow you access to the space a minimum of 2 times a week; with a schedule to be set later for those open times. Everyone signing up at the $25/month level will move us 0.5 towards our goal of 20. There is a timeline to get our membership funding in place to keep the lease offer valid. We need to hear back from you by end of day on Monday, July 31st, but ideally we are hoping you will decide quickly and get back to us. We will apply to lease the space as soon as the goal is reached. Because we have changed the goals and expectations slightly we want anyone who is ready to commit to this space to email us. If you already committed since June you can just give us a Yes or No. 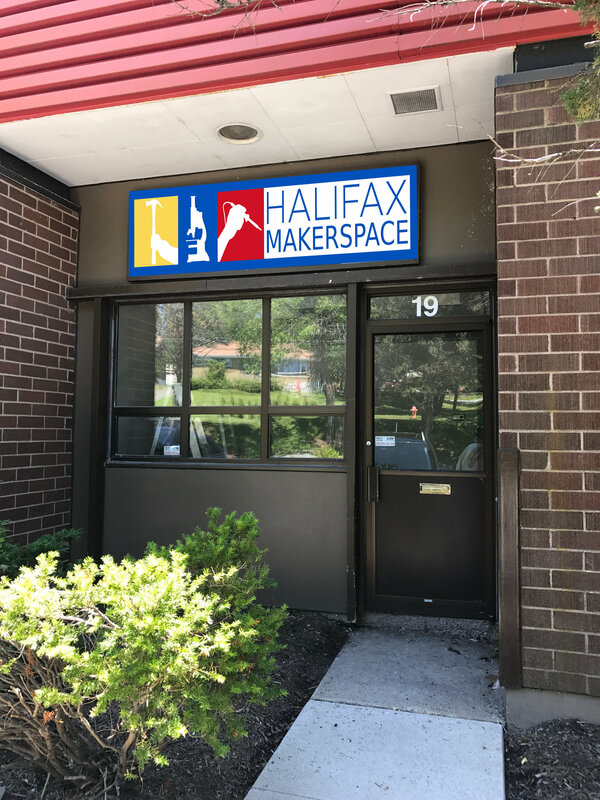 You can do so by emailing info@halifaxmakerspace.org . If you hadn’t committed yet but this new location has you excited also please provide us your name, phone number and whether you are committing at the $50 or $25 level. If you have any questions before committing you can email us, or join us for our regularly scheduled Social Night on Wednesday, July 19th 7pm-9pm at Uncommon Grounds cafe on South Park St.
What Happens at the Deadline?If we hit our goal of 20 we will immediately cut a cheque for the deposit, receive the keys to the space, and plan a date to move our stuff from storage into our new makerspace. The plan that we accepted at the last AGM is reaching the end of the year we committed to. So this is our last kick at the can for pursuing a space. If you want to see this happen the time is now. If we do not reach our goal, we will continue to do fun projects out of members’ houses, teach courses at the library, etc., but we will cease trying to make a physical space a reality in order to concentrate our resources on making this “virtual makerspace” prosper. Please don’t delay. Please forward this email to any people or groups you think would be interested in supporting us.